The Marceline and Emma yurts are designed for summer and winter recreation. 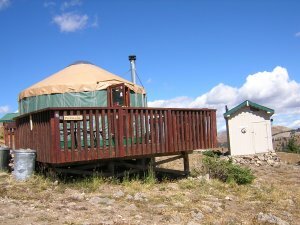 Our yurts offer unique lodging, spectacular views, intimate contact with the land, and endless recreational opportunities. Located above the pristine Empire Reservoir at 12,000 ft. above sea level, these yurts are nestled behind the Mosquito Mountain Range and Mt. Sherman. Climbing the ridge behind the yurts, the views of Mt. Elbert, Mt. Massive and the Collegiate ranges are spectacular! Opportunities for wildlife viewing include elk, deer, bear, redtail hawk, sheep as well as many other animals. In winter, "bowl" skiing is limitless! 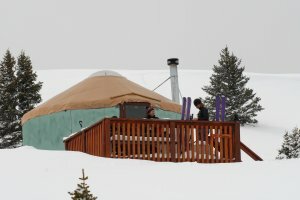 The yurts are located in the backcountry and are not accessible to town or Ski Cooper. In winter, the yurts are not for very beginners as extreme winter conditions exist. The trek to the yurts are for the more experienced and fit that possess above backcountry ski skills and knowledge. In summer, the yurts can be accessed with a high clearance 4-wheel drive vehicle as the road is very rough and steep in spots.